Elijah the Prophet visits us on Passover, but Yotam Ottolenghi was at our table on Rosh Hashana. I already told you about the fish we had on first night from his cookbook Jerusalem. But I cracked open both Plenty and Plenty More for our vegetarian guests the second night. I know I should be talking about the fresh corn polenta and eggplant because it’s September and both of those foods are pretty much perfect right now. But my guests and I both agree that it’s the roasted red onions with walnut salsa that needs to be talked about. I’ve had my eye on this salad for as long as I’ve had this cookbook in my collection. Roasting the red onions until they’re golden on top and near translucent in the rings takes the bite out of them and renders them almost sweet. 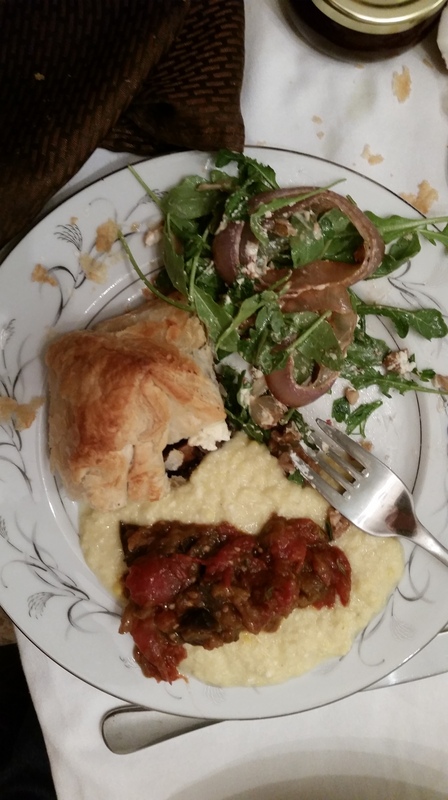 The arugula provides a nice contrast, and the goat cheese connects the two with its tang. And the walnut salsa. Oh, the walnut salsa. Because I know a lot of you are wondering — it’s a mushroom tart. Ottolenghi recipes are often pretty labor- and time-intensive, but not this one. Yes, the roasting of the onions will take about 40 minutes, give or take, but everything else comes together very quickly – you put the walnut salsa together while the onions roast to give them some time to get to know each other. I set the half cup of parsley in two rounds of cold water to clean it. As per usual, I only used about half a hot pepper, but how much you use is entirely up to you. Where it says to brush the onions with olive oil and sprinkle with salt and pepper, I just tossed everything in a large bowl and then lay them out on a baking pan covered in parchment paper. I have a five pound bag of red onions, a 10 lb. bag of walnuts from Costco, a second log of goat cheese, two bunches of parsley, leftover arugula and the remaining half of hot red pepper. So, basically, I’m making this again for dinner tonight. I couldn’t forgive myself if I didn’t. Peel the onions and remove the tops and tails. Cut each crosswise into 3 slices, about 3/4-inch/2-cm thick, and place on a baking sheet. Brush the slices with the olive oil, sprinkle with ¼ teaspoon salt and some black pepper, and roast in the oven for about 40 minutes, until the onions are cooked and golden brown on top. If they haven’t taken on much color, place under a hot broiler for a few minutes. Set aside to cool slightly. While the onions are cooking, put all of the salsa ingredients in a small bowl, add ¼ teaspoon salt, stir and set aside. To serve, put the arugula and parsley in a large bowl. Add the warm onions, the cheese and half the salsa and toss carefully so the onions don’t fall apart. Divide among shallow plates, spoon the remaining salsa over the top, and serve. 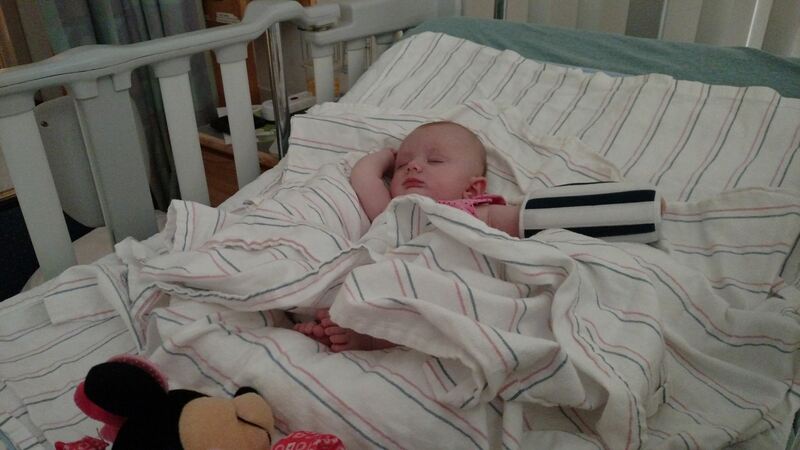 We had some scary moments this weekend, which culminated in an overnight stay at Children’s Hospital. They are very nice there, but it’s a place you’d rather never be. 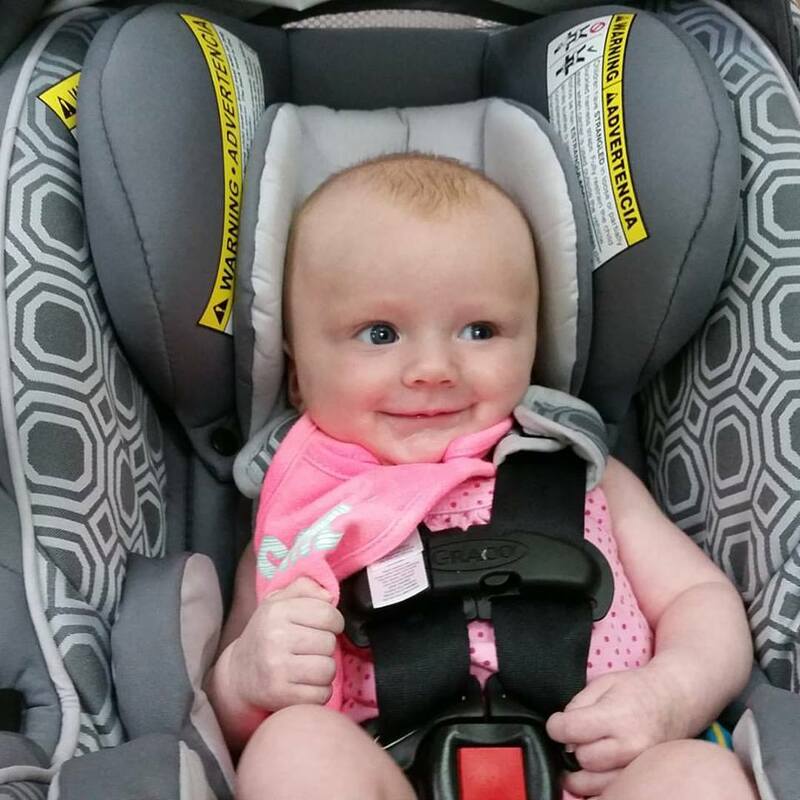 Thank goodness, it was all just a scare, and I have two healthy daughters. Mostly it was a lot of waiting for test results, and so I found myself with something I haven’t had a lot of: time. 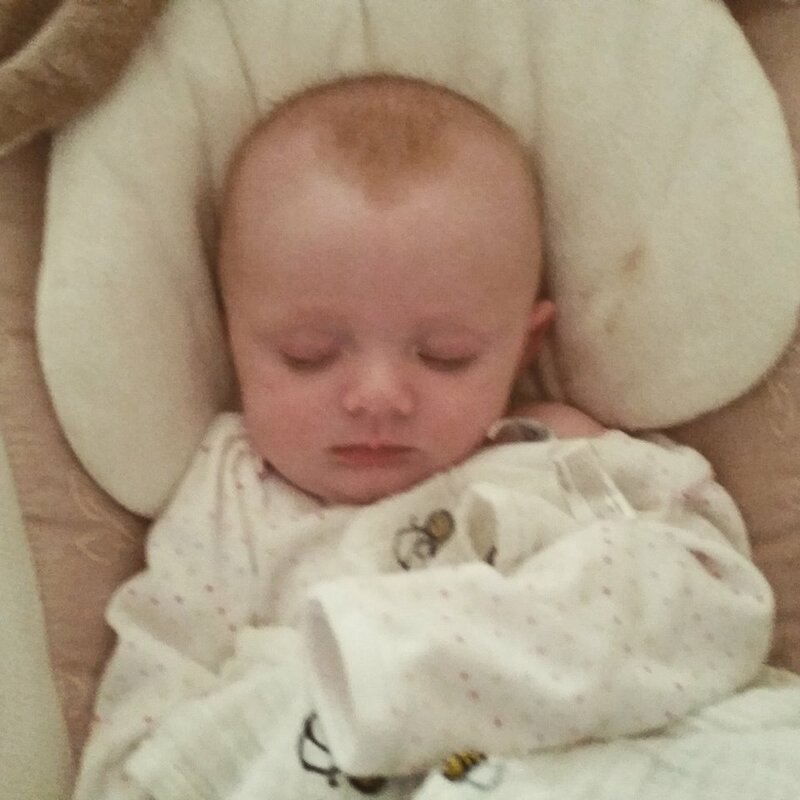 (Big sister was with her grandparents.) I got to read two back issues of Food and Wine, something I just don’t have the time to do right now. Sylvie and Miriam actually had Indian food delivered to our room on Saturday night, and I enjoyed the leftovers this morning as my Sunday brunch. It was great Indian food — my stepdad calls it the $10,000 meal. I kept in contact with my family via text. This morning, as I texted Sylvie a third time to thank her for the for the awesome food, we fell into a discussion about Rosh Hashana meal planning. I’m hosting for the first time in my life next week, and I’m busy plotting my menus and testing out recipes. Soon we moved to the phone to really have a conversation about the meals. I’m still figuring out a lot of the menus, but I am pretty sure I’m going to make this Ottolenghi fish dish. It’s tradition to serve fish on Rosh Hashanah — fish head, actually, but close enough. Ottolenghi calls its sweet and sour fish, but it’s more sweet than sour — perfect for the new year, and very delicious. Ottolenghi suggests “serving it at room temperature, preferably after resting for a day or two in the fridge, with a chunk of bread.” I can confirm this, so I plan on making this on Saturday night for Sunday. When I tested this recipe last week I used four pieces of frozen cod from Costco that I always keep on hand. “Small whole fish are also good here: red mullet, sardines, or a small mackerel, scaled and gutted,” writes Ottolenghi. The peppers and tomatoes are end of summer foods at their finest hour. Heat 2 tablespoons of the olive oil in a large ovenproof frying pan or Dutch oven over medium heat. Add the onions and coriander seeds and cook for 5 minutes, stirring often. Add the peppers and cook for a further 10 minutes. Add the garlic, bay leaves, curry powder and tomatoes, and cook for another 8 minutes, stirring occasionally. Add the sugar, vinegar, 1 1/2 teaspoons salt, and some black pepper and continue to cook for another 5 minutes. Meanwhile, heat the remaining 1 tablespoon oil in a separate frying pan over medium-high heat. Sprinkle the fish with some salt, dip in the flour, then in the eggs, and fry for about 3 minutes, turning once. Transfer the fish to paper towels to absorb the excess oil, then add to the pan with the peppers and onions, pushing the vegetables aside so the fish sits on the bottom of the pan. Add enough water just to immerse the fish (about 1 cup/250ml) in the liquid. Place the pan in the oven for 10 to 12 minutes, until the fish is cooked. Remove from the oven and leave to cool to room temperature. The fish can now be served, but it is actually better after a day or two in the fridge. Before serving, taste and add salt and pepper, if needed, and garnish with cilantro. My office is close enough to the Watertown Free Public Library that I can spend my lunch break there and know I can make it back to my desk with time to spare. It’s a great library – full of sunlight and helpful librarians. The children’s department looks massive and I keep on meaning to take Lilli there on the off chance we get to spend the day together. 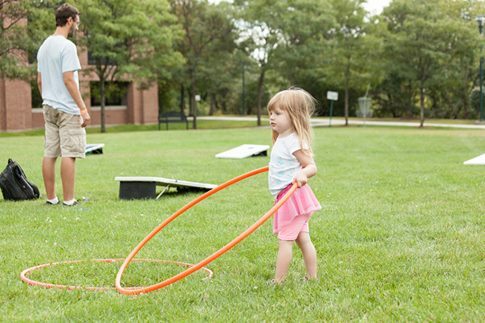 Best of all, it’s part of the Minuteman Library system, a consortium of more than 30 local towns’ libraries. So if for some reason the Boston Public Library – a place that a librarian friend calls a library “on steroids” – doesn’t have what I’m looking for, I have 30 more chances that the book, or movie, or album, can be found. This past summer I went in search of travel books to Montreal. I remembered that Watertown’s collection was more up-to-date than the BPL’s when I planned our trip to Europe a few years ago. And as tends to happen, I found myself in the cookbook section where I was excited to find The Mile End cookbook, the cookbook of the deli in Brooklyn founded by Montrealers who missed their hometown’s smoked meat. Unbeknownst to me at the time, the cookbook also featured a walking map of their favorite food joints in the Mile End. And this was on top of a book devoted to smoked and pickled things, two of my favorite ways of preparing foods. I bookmarked and Xeroxed recipes that piqued my interest. There’s an olive oil cake recipe I plan on baking for Chanukah, but first up is this honey cake. This honey cake is divine. It’s moist. It’s warm and spiced up because it is by their parents’ old neighbor, baker extraordinaire Marcy Goldman, who based it on a gingerbread recipe. It calls for a cup of honey, which sounds like a lot, but the bear on my counter still has honey in his belly. I only had dark brown sugar in the house, which gives it an extra nice molasses feel. The first step is something I’ve never done before, which is combine orange juice and honey in a saucepan then add baking soda to it. It fizzles and bubbles like a fourth grader’s volcano, and it gets set aside. I actually baked this cake in a number of steps, in between dinner, bath time and post-bedtime, so I can confidently say it’s OK if you set aside the saucepan for an hour to tend to something. This recipe is machine-free, just calling for some whisking and stirring. Place your eggs in a bowl of warm water if you forget to take them out ahead of time. Two caveats with this recipe: I’ve baked it twice and can report that the bake times the recipe calls for need to be just about doubled, at least with my oven. Also, I’ve oiled and floured the Bundt pan very well, but this cake does not flop out when flipped. Just cut out the pieces to serve. It still tastes delicious. Best wishes for a sweet and happy new year. L’Shana Tova Umetukah! Preheat the oven to 350F. Combine the orange juice and honey in a large saucepan. Place it over medium-low heat, bring it to a simmer, and simmer until the liquids have come together and you can no longer feel any honey sticking to the bottom of the pan, about 5 minutes. Remove the pan from the heat and add the baking soda; stir to combine, then set the pan aside. In a large bowl, combine the eggs and sugars and whisk vigorously until smooth. Then add the oil and whisk until the mixture is completely emulsified and smooth. Pour the reserved orange juice mixture into the egg mixture and whisk for a few seconds to combine. In another large bowl, combine the flour, baking powder, cloves, cinnamon, nutmeg and salt; mix together with a spatula. Pour the liquid mixture into the dry ingredients and whisk, scraping down the sides with a spatula, until any lumps are eliminated, 10 to 15 seconds. Grease a Bundt pan with oil or cooking spray and dust the pan liberally with flour, tapping out any excess. Pour the batter into the pan and bake on the middle rack of the oven until the surface starts turning a golden brown about 15 minutes. (Or longer, depending on how badly your oven needs to be recalibrated.) Rotate the pan 180 degrees and tent it lightly with aluminum foil. Continue baking until a thermometer inserted reads 200F and a knife comes clean. Another 20 to 25 minutes. (Or more, depending on how badly your oven needs to be recalibrated.) Cool the cake completely on a wire rack. Invert it onto a serving plate and drizzle it with honey. Top with toasted almonds and powdered sugar, if you like. I try as best I can to write this blog seasonally, so that the recipes will line up with the fruits and vegetables available at your market. (Apologies to those reading in Israel.) But in the world of journalism, where I come from and where I still have a small role, it doesn’t always work that way. I guarantee you that editors – magazines, newspapers, and even online publications – are currently busy putting together their Thanksgiving sections. And so for the Rosh Hashana section you are reading this week and last in your go-to papers, the editor began crafting that in early summer, probably even earlier as this year is the earliest I’ve ever remembered it being. A few years back, the kindest editor I’ve ever had hired me for a freelance food article for his upcoming Rosh Hashana section. 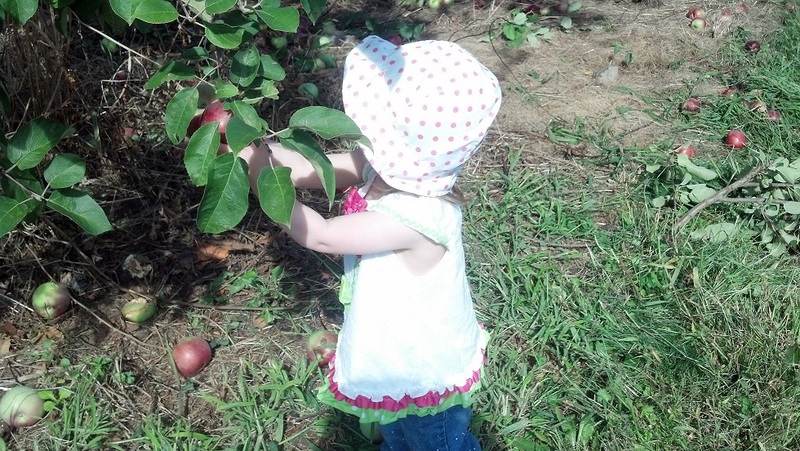 The assignment was delightful: Explore some local apple orchards, pick a few bushels, bake and cook up a few dishes, and write it all up. And make sure to photograph the process the entire way through. There was a hitch, though: The article was due on September 1, so he could get the section out at least a week before the start of the holiday. 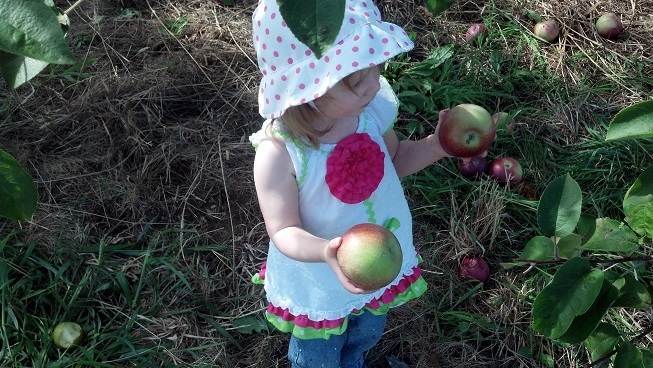 But going apple picking in August in New England is, um, tricky. Basically, the months of September and October are prime times for apple picking, but August is still all about stone fruits. Every orchard we tried was just like my CSA has been for the past few weeks: Full of perfect peaches, and nary an apple in sight. 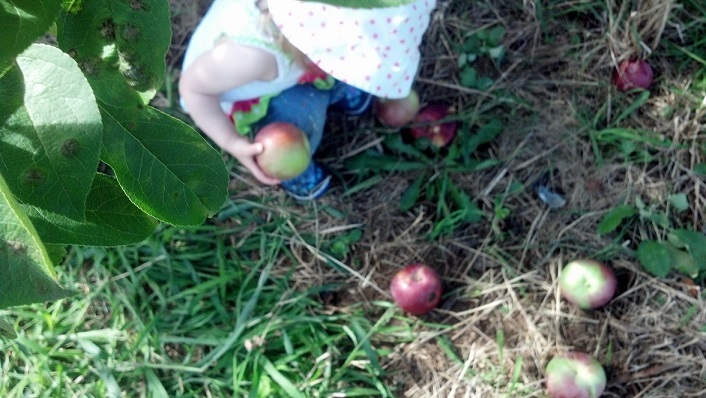 So while we went and picked and photographed, the apples I used for the recipe came from the grocery store. It may not be a traditional fall recipe, but I think Lilli approves. 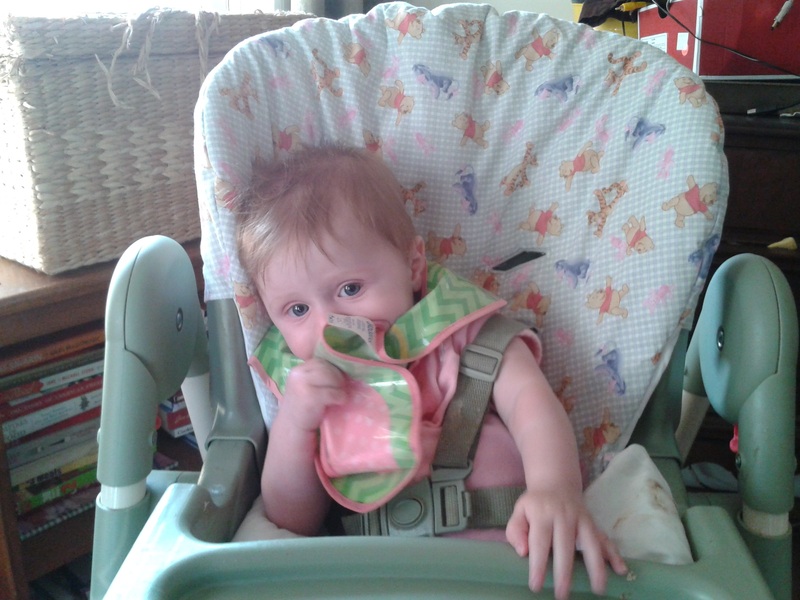 When we fed her peaches a few weeks earlier, she finished the meal by licking the juices off her bib. I’m calling this a pound cake, but it’s certainly been updated from the traditional “pound of butter, pound of sugar, pound of flour…” recipe. 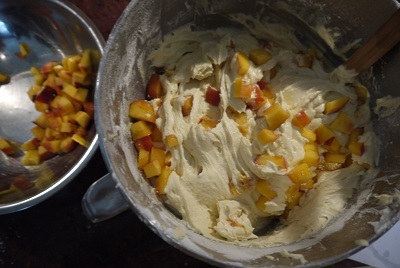 In addition to the peaches, there’s both vanilla and almond extract, which gives the cake a great flavor. The batter is also remarkably fluffy, given all the eggs, butter and sugar. A few notes: Thankfully, you don’t have to peel these peaches like I have to when feeding Lilli, or like the other peach cakes I’ve baked this summer. The recipe says you can use frozen peaches too, so I guess you can make it in the dead of winter. I never have sour cream on hand, but always have Greek yogurt around; it makes a great substitute. Although the recipe doesn’t say it, please put the tube pan on top of a baking sheet. Twice I’ve had to enlist Rich’s help to scrape errant batter that has dripped from the tube hole onto the oven racks and bottom. I know, you’d think after the first time I’d have learned my lesson. The recipe calls for confectioner’s sugar once the cake has cooled down, but I would call that optional, as I’ve just simply forgotten that step two times now and the final product has been delicious. Grease and flour a 10-inch tube pan. Combine the dry ingredients and set aside. Cream the butter and sugar until light and fluffy. Add the eggs, one at a time, beating well after each addition. Beat in the extracts. Add the flour mixture, alternating with the sour cream, beating well after each addition. Pour into the greased a floured 10-inch tube pan. Bake in the 350-degree oven for 60-70 minutes or until a toothpick inserted near the center comes out clean. Cool for 10 minutes before removing from pan to a wire rack to cool completely. Dust with confectioner’s sugar if desired. I originally wrote this piece for Combined Jewish Philanthropies to help get word out about their Fast to Feed initiative. A number of people contacted me offline for the plum cake recipe, so I’ve decided to also share the post and the recipe here. 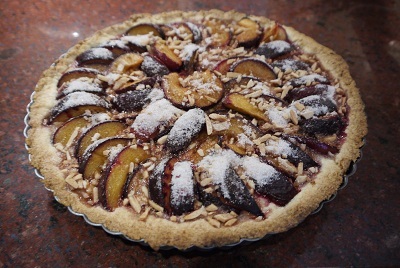 Recently, Prism asked me to teach a class on how to bake plum cake for Rosh Hashanah. So what qualifies me as a plum cake expert? I guess I have to credit my Mom’s family. They are German – yekkes, as they would proudly say – and my Oma would always bake a zwetschgenkuchen (or some say pflaumenkuchen), a traditional plum cake, for the holiday. Someone recently asked me about the looming symbolism of the plum for Rosh Hashana, hoping to find some sort of sweet correlation as with the apples and honey. Well, to be honest, as far as I know, late August and early September was when the Italian plums were ripe and hung heavy on the trees of the German and Alsatian countryside. So plum cake for Rosh Hashana made sense. And was always delicious. A few years back I made a zwetschgenkuchen to bring to my mom’s for the holiday. 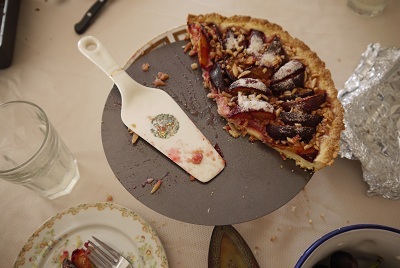 I used the pitch-perfect plum torte recipe from the New York Times archives. The plums were wrapped in soft pillows of batter, and topped with cinnamon, lemon and sugar. Just splendid. But when Prism asked me to lead the plum cake baking class, my mom jumped at the chance to share a genuine kuchen recipe with me. It turns out my Oma, along with millions of other Germans Jews before her, based not just their plum cakes, but their general baked goods, on a mürberteig, a “shortcrust dough.” This morning I took the recipe for a test run, cutting the butter into the flour, making pebbles of dough that eventually formed a ball to kneed and roll out. We hosted friends for the taste testing that afternoon. 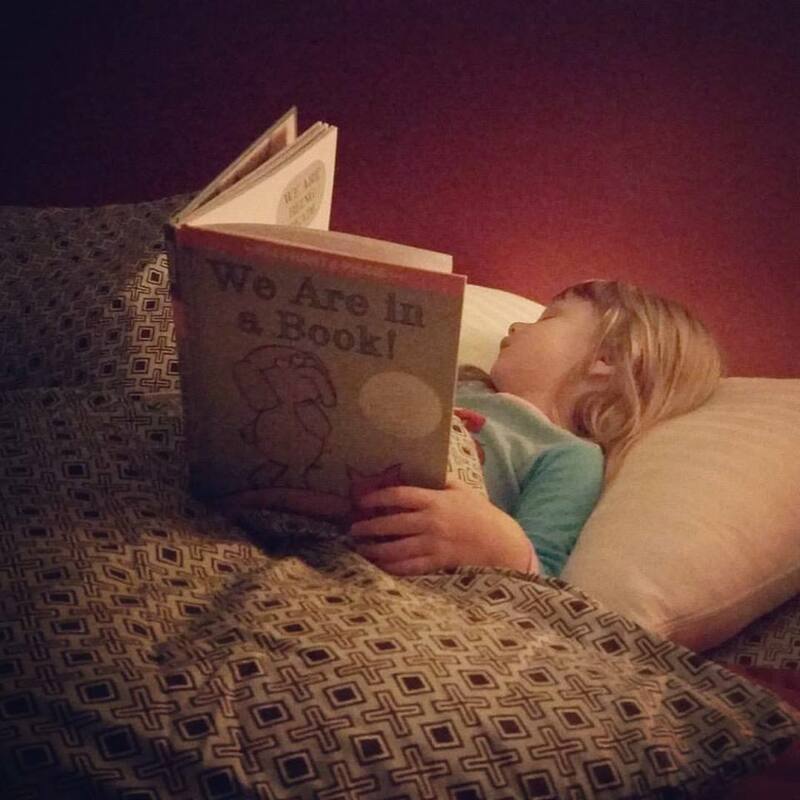 As it happens, they are Mormon and, as strange as it sounds, we actually understand the choices we’ve each made through our respective religious outlooks. My not eating pig and shellfish is similar to their choice of not drinking alcohol or coffee. When I told them about Combined Jewish Philanthropies’ Fast to Feed program, they got it. As I explained, Jews observing Yom Kippur abstain from eating and drinking. Why not take the money you’d be spending on food during that day, and donate it to a program that feeds one of the 700,000 people that go hungry every day? Well, it turns out that Mormons have a fast on the first Sunday of every month, and the money they’d be spending on food is donated to feed the hungry. No kidding. 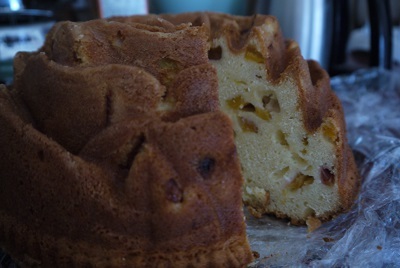 The plum cake was fantastic, and I’m thrilled to be teaching my family’s tradition on Thursday night. This sweet dessert starts with a Murberteig, a mellow or short dough, which is the basis of many German baked goods. Simply, it’s a shortbread dough. For this recipe, you will need a pastry cutter, a large bowl, a rolling pin, a dough scraper, and a tart pan. Cube the butter and place in freezer while you gather and measure out the remaining ingredients. In a large bowl, combine the flour, baking powder, sugar and salt. Mix them together with a whisk or a large spoon. Sprinkle the chilled butter cubes over the flour and begin working them in with the pastry blender, using it to scoop and redistribute the mixture as needed so all parts are worked evenly. Soon enough, all of the butter pieces will be the size of tiny peas. Make a well in the center of the bowl. Add the beaten egg and using a spatula, mix thoroughly. Soon enough, the dough will come together. Knead the dough on a breadboard/hard counter. This dough has a very high butter content, so refrigerate it while you prep the rest of the ingredients. Halve and pit the plums. Slice the fruit into quarters. Set fruit aside. Chop the nuts. Place in bowl with the sugar and cinnamon. Stir. Remove the chilled dough from the refrigerator. Flour your counter, the dough in the middle and the rolling pin. Start rolling your dough lightly from the center out. You’re not going to get it all flat in one roll or even twenty; be patient and it will crack less. Roll it a few times in one direction, lift it up and rotate it a quarter-turn and repeat. Re-flour the counter and the top of the dough as needed to avoid sticking. Roll the dough out to a little more diameter of your tart pan, enough to cover the entire the inner sides of the pan. Using the dough scraper, gently move the rolled-out dough onto and press into the pan. Don’t worry if you get a crack or hole; just use some of the excess from the edges to patch it up! 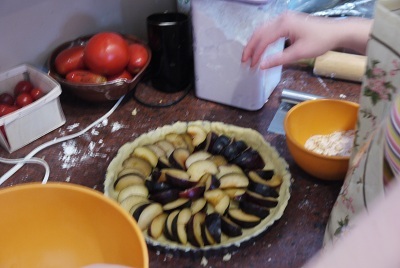 Starting with the outer rim, arrange the sliced plums in a circle on dough. Bake in a preheated, 375-degree oven for 30 minutes.